Highlands has won four in a row over the Pioneers. The last time Simon Kenton beat Highlands came 2-0 on Aug. 30, 2014 at Tower Park during the rough 0-6-2 start that season. The strong ball possession game led to 23 shots for the Bluebirds including 11 on goal to no shots at all for the Pioneers. 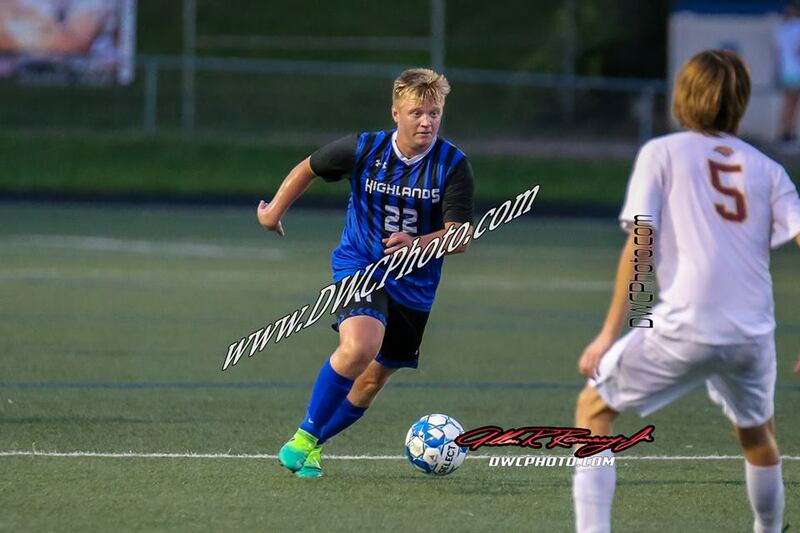 Virtually anytime Simon Kenton's players touched the ball, the Highlands players played the passing lanes perfectly or made solid tackles to take the ball back quickly. Simon Kenton senior goalkeeper Jack Mairose kept the Pioneers in the game making seven saves. "It was a good overall showing," said Chad Niedert, Highlands Head Coach. "We just had to be patient. If it's 0-0, you get stuck in that score then you end up being frustrated. We tried to make sure we focused on what we could control and that was how we were playing, effort and things like that." That meant the two Highlands goalkeepers in senior Will Burnham in the first half and junior Nick Fischer in the second half didn't have to touch the ball much. Highlands consistently won the 50/50 balls at midfield. "We just planned on playing simple in the midfield and distribute up to our forwards," said Keegan Brewer, Highlands senior midfielder. "They made things happen and created chances. Our defense is great. We all work together as a unit and step to the ball so (opponents) can't create things." Simon Kenton had two straight corner kicks in the second half. But the Bluebirds played the second one out of the box and moved downfield. On the other side, Highlands had seven corner kicks. Highlands and Simon Kenton made it to halftime scoreless. The only other time that happened to the Bluebirds this year came in the scoreless tie against Lexington Paul Dunbar. "We were pretty positive at halftime," Niedert said. "We created plenty of chances. We just weren't getting on the end of it. It was that final touch. We have a lot of speed out wide with height and we utilize it." Highlands did have a free kick just outside the box. But the Bluebirds did not get the kick off in time giving the ball back to Simon Kenton. The Bluebirds scored the game's first goal with 28:39 left in the game. Senior Porter Hedenberg dribbled around a Simon Kenton defender near the line to the left of the goal and played a nice pass to senior Luke Schweitzer in front of the net for the score. That marked the third goal of the season for Schweitzer and Hedenberg his team-high fifth assist of the season. "It was really nice," Hedenberg said. "(Schweitzer) went to the right spot. I just chopped it right back to him. He was wide open for the goal." Highlands added an insurance goal with 7:30 left in the game. Sophomore Max Farris dribbled into the box and drew a penalty. Senior Carter Holmes took the penalty kick, coaxed Mairose into diving to his right and buried it for his second goal of the season to make the final score. A total of 20 fouls came on the teams. Highlands had 12 and Simon Kenton had eight. But the only yellow card of the game went against the Pioneers. Highlands returns to action Tuesday at Tower Park in the annual 36th District showdown against the Newport Central Catholic Thoroughbreds (4-1). Game time is 8 p.m.
Highlands did not take a full team to the race at Sherman Elementary School. But Highlands did see some strong individual performances. Sophomore Greta Noble finished 18th in the girls race in 20 minutes, 58.3 seconds out of 127 runners. Highlands did run five in the boys race to post a team score. 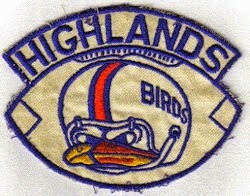 The Bluebirds finished 12th with 284 points. Covington Catholic won the race with 38 points. Bluebird sophomore Peter Laskey finished 17th in 18:14.5 out of 156 runners. Highlands runs in the Mason Invite on Sept. 8. The location is Corwin M Nixon Pine Hills Lake Park in Mason (Ohio). Highlands moved to 3-0 with its third shutout of the season. Junior quarterback Collin Hollingsworth led the way rushing for two touchdowns and throwing another one to junior wide receiver Adam Weyer. Junior Wes Bowling rushed for the other Bluebird touchdown. Sophomore defensive back Bryson Cody intercepted a Beechwood pass on the Highlands 1 and returned it to midfield. Also, junior linebacker Logan Webster had a fumble recovery for the Bluebirds. Highlands takes on Ryle at 10 a.m. on Sept. 8 back at David Cecil Memorial.